Re-modelled 6th and 7th greens. New fairway bunkering at 6th hole. 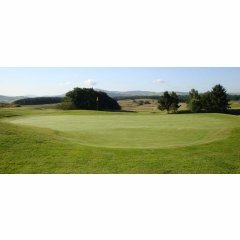 The 7th green at Lanark had been a problem for a number of years and the Club decided in 2006 to call in a professional GCA to help. This was completed in 2006/7 and the new green is shown in the foreground of the above photo. The green was raised by between 15 and 30cms and this helped to make it more receptive with a gentle slope from back to front. It is a small target for this short hole and the bunkering has been upgraded signifciantly. The raised green also allowed me to create deeper bunkers. The previous bunkers were very weak and shallow and very poorly integrated with the green sirface. 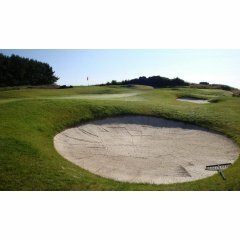 The new bunkers were created in unison to achieve more naturally rolling connections between the green and bunkers and also the bunkers themselves. This is a short hole that shows how a par 3 does not need to be long to be challenging. The Club has plans to renovate the 3rd green in the winter of 2012.